At its September program meeting, Meyer Memorial Trust awarded 40 grants and one program-related investment (PRI), totaling just over $6.1 million for organizations working across Oregon and southwest Washington. 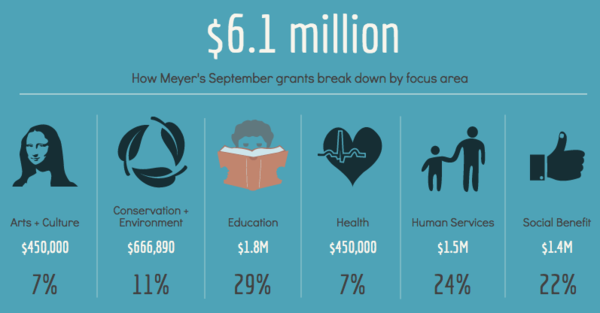 These grants bring the total awarded since Meyer began operating in 1982 to 8,926 awards totaling just shy of $690 million. Eight grants, totaling $1.46 million, and representing 24 percent of all Meyer funding awarded in this month, fall under the category of human services: Those include a grant of $250,000 to support the Rose Avenue Project, helping relocate two vital community nonprofits in Vernonia above the floodplain, and a grant of $200,000 to help build a new home for a relief nursery program serving Malheur County, Oregon's highest poverty county. Eleven awards, amounting to nearly $667,000, focus on conservation and the environment: Those include grants totaling of $20,000 for community screenings of the Willamette River documentary film, UPRIVER, in Benton, Marion and Multnomah counties, plus $200,000 to support Model Watershed Programs along the Willamette River. Two grants, totaling $450,000, are health-related. One of them, a $250,000 grant, helps create a training facility in Beaverton to provide expanded services to thousands of new low-income patients each year. The other, a $200,000 grant, will help a Portland-area treatment center upgrade its electronic health records and technology systems. Eight education grants total $1.78 million. One of those grants, for $400,000, helps construct a new Head Start facility in Douglas County. Another $85,000 grant supports an organization dedicated to providing civic education to students and teachers across the state. Three arts and culture grants, equal to seven percent of the September awards, total $450,000. One of the grants, for $200,000, is aimed at restoring an historic venue in rural Umatilla County. A $100,000 grant helps support operations at a seven-year-old theatre in Northeast Portland's King neighborhood that focuses on producing quality performances for diverse audiences. And eight grants and a program related investment, totaling nearly $1.4 million, for 22 percent of this award batch, focus on social benefit, including a grant of $150,000 that supports efforts to bring the new daily, year-round, indoor-outdoor James Beard Public Market to an area near Portland's Morrison Bridge, and a $500,000 loan to help support the vision of "The Redd on Salmon Street," a 75,000+ square foot space dedicated to Oregon's regional food system. How the grants and loan break down by county and focus area.